Sundance artisan Margaret Taylor, the visionary behind these cool wooden guitars, is a designer and artist who grew up surrounded by music. So it’s only natural that her guitar wall art represents designs that come from a place close to her heart. To create these intricate beauties, Margaret takes an eco-friendly approach. She sources only old, reclaimed wood. She looks at each piece to make sure it has all of its texture and character and idiosyncrasies intact before getting lacquered with her designs. “One of the really fun aspects of making items like the guitars,” she shares, “is finding and figuring out which parts and pieces of old hardware or which architectural items that will add to the interest, charm and playfulness.” Her search for materials includes finding unexpected delights such as thumb screws, piano parts and lock washers. These all serve to add an interesting “found object” aspect to the guitars that makes each one unique. The wood itself varies from guitar to guitar. The pieces typically get reclaimed by Margaret from old wooden houses from around the South. Repurposed items typically include window casings, tongue-and-groove flooring and beadboard from old porch ceilings, plus some tin components. 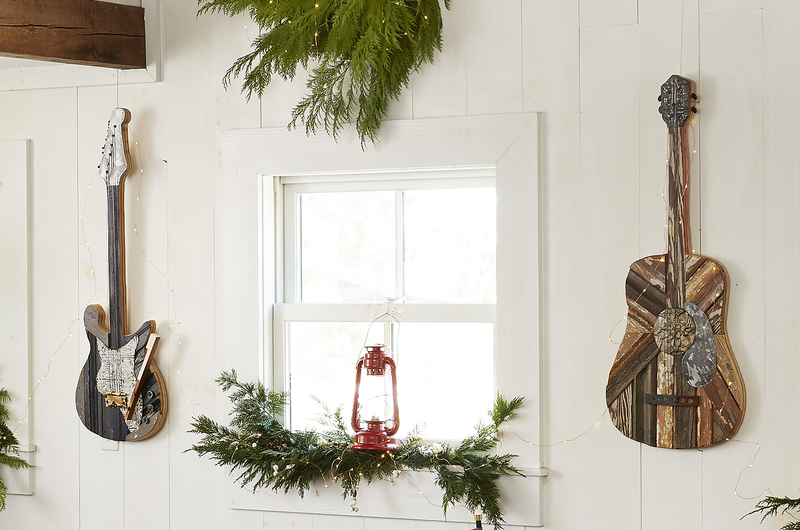 While these are decorative and not working guitars, it is important to a music lover like Margaret that each guitar get a stamp of approval from her musician friends. Only then does she feel good about sharing them with the world. Find the electric guitar here and the acoustic guitar here. Shop all home decor here.